Now that the snow is finally melting and the sun is shining, many of us have a little extra spring in our step now, but with the change of season it is unlikely that your car and home are as prepared for the changes and may be a bit “sluggish” from winter weather. So, let’s look at some areas that may require a little TLC as we kick off the spring season! Remember that if you care for your home and show it the proper love, it will return the love back; of course, the only way to ensure this is through regular maintenance. One of the best ways to avoid having to submit a home insurance claim is through the proper maintenance jobs that every home owner should be completing. Your roof ultimately keeps the elements from entering your home, so if there are shingles that are cracked, curling or loose, this may be a sign that the roof should be replaced. Clean your eavestroughs and also look at them to see whether they are leaky or loose. Make sure your downspout extends at least five feet from your house, so water drains away from the property in an effort to reduce the risk of a flooded basement. With spring comes heavy rainfall and it can be common at this time for branches and trees to fall over, damaging homes. If you notice trees that appear unhealthy on your property, you may want to consider getting rid of them for safety reasons. When it comes to healthy trees surrounding your lot, be sure to keep them pruned on a regular basis so they don’t pose a risk to your home or utility wires, if a branch breaks and falls. If your walkway or driveway appear to have some unevenness or cracks, get these repaired as soon as possible to prevent slip and falls that could otherwise occur on your property. Not all cracks in your foundation are a red flag and some can even be considered normal; However, if you see cracks in an unfinished basement or outside your home, always mark them with tape so they are clearly identifiable. Now that they are visible revisit them in three months to see if anything has changed. If all looks the same, simply fill in the cracks with an epoxy injection. If the cracks are larger or there are more currently, you’ll want to hire a professional contactor to look after it. Of course, you’ll want to make sure your cars and any other family vehicles are cleaned up from the winter as well! There’s a good chance that your car will show signs of wear and tear as well. Give the interior of your car a lift by wiping down the windows, giving the floor mats a good wash, getting rid of collected trash, and vacuuming the upholstery and carpet to eliminate the dirt and road salt. After this area has been looked after, next comes cleaning the exterior; begin with the roof and work your way down the vehicle so that you don’t miss anything. We suggest that you use mild diluted soap and dry your car immediately after to stop water spots from occurring. 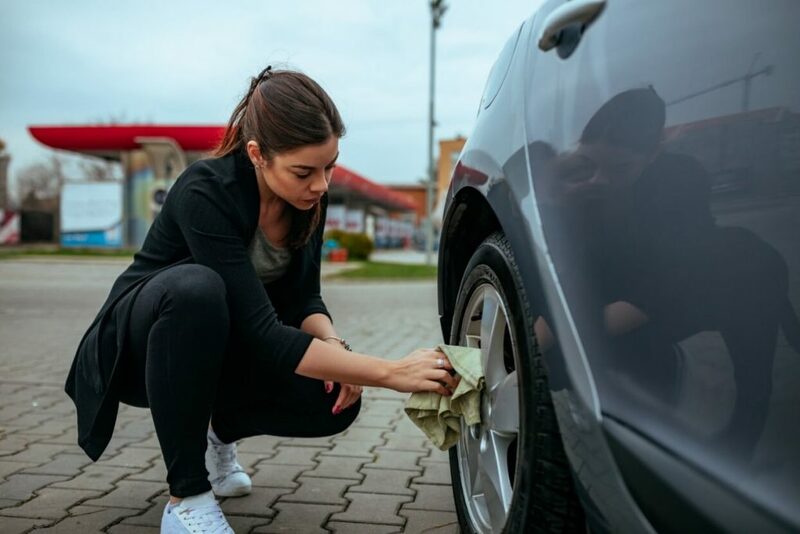 Wiper blades should be changed at least twice a year, and there is no better time to take this task on than when you’re going through your spring-cleaning jobs. While most people are aware, winter tires do not do well in warm temperatures; in fact, they will wear out much faster and won’t work as well as your summer or all-season tires. Once temperatures reach at least 7° Celsius, you are likely in the clear to switch them out. Check your tire pressure as well as your spare tire. Review your owner’s manual to see what your tire’s pressure should be at, and also check your tire’s treads: tires are manufactured with wear bars and when the bar begins to expose itself, you’ll probably want to swap them out for new ones. Take your car to a reliable mechanic for a basic spring tune-up. Included in this service should be having your car’s oil and other important fluids checked, as well as having the filters, belts, hoses, lights (both interior and exterior) and the battery all looked at. Whether it’s your home insurance or your car insurance, at Will Marshall Insurance we can help you save on the coverage you need. Call Will Marshall today at 705-726-2551 in Barrie or 705-326-5664 in Orillia.